There is a question: how to calculate volume of water in a cylinder? We can expand the question by specifying what type of the cylinder we mean: a vertical or horizontal one, with uneven or flat bottom. If there is a need to estimate the volume, required for the clarification of the fluid amount and cubic capacity of a cylindrical tank, first, you have to specify the parameters of the tank. Only then you can insert the parameters to our online tube volume calculator. The geometric method of the cylinder capacity estimation is to be applied when specifying the main parameters of the reservoir cubic capacity (in cases when we have a barrel or a storage tank). The reservoir calibration methods are not the correct option to be chosen, as in the last case the volume is estimated on the base of the actual measurements of the liquid amount in the reservoir by the gauging rod. S — Area of the cross-section. After the applying the formula and when the results are received, the calibration tables are drawn up for the reservoir. The tables are also known as gauging tables and they can be used to identify the weight of the fluid in the container or tanker on the basis of the specific weight and volume. These characteristics depend on the level of the actual fluid amount in the tanker. The gauging rod can be used to define it. The given app can estimate the amount of liquid in a reservoir, specify the square of surfaces, total and filled volumes. Moreover, these complicate calculations are done online, so you get an immediate result. Now it is a simple matter to find the volume of the cylinder tank as it provides estimation of the total and filled volumes of the water tank, oil tank, reservoirs like a tube tank, and others of horizontal or vertical cylindrical shape. Sometimes it is also needed to estimate a surface size of your tank. For instance if you want to paint a tube, it saves your money if you will not outspend the pain. For this purpose the function of cylinder surface area calculator is needed. The more accurate you take the measurements, the more accurate and correct the output you are going to get. Therefore, it is undoubtedly important to define the main parameters correctly. Be aware, the inside dimensions of the tank are assumed to be used. D — Diameter of the tank. How to get all main data in a correct way? You can measure the length L of the cylindrical reservoir with the uneven bottom by an ordinary gauging tape. You have to measure the distance between crossing lines of the bottom with the cylindrical body of the tanker. If the tanker has a flat bottom, you have only to specify the outside length of the container (from one end to another), and deduct the thickness of the bottom from the previously received figure. 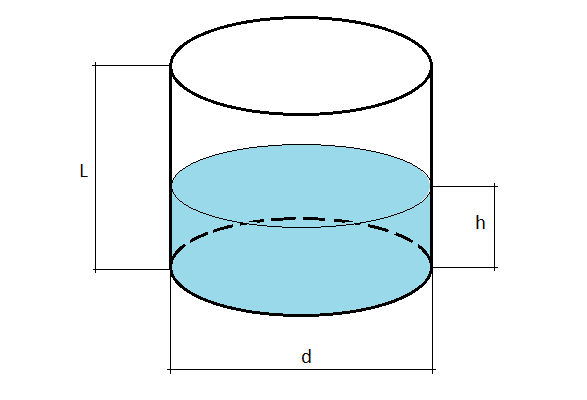 To define the diameter D of the cylindrical reservoir is the easiest part of the game. You should measure the distance between two edges of the end or a lid by the gauging tape. When the container is of the shape that makes such measurements too complicate, then you can find the circumference. Area of the side surface in m². Note, the app has advanced functions and another usage could be a vertical cylindrical tank volume calculator. Good luck with your estimations.